Our Recommended Reads series continues today with a look at some classic humorous series for young readers. New offerings to the overflowing children’s books genre abound, and some of them are worthy indeed. But with all these flashy newcomers, it can be easy to forget about some of the time-tested classics whose humor will continue to motivate and appeal to children even decades after they were originally published. Below are some of our favorite series, which are as delightful and relevant today as they were when they first hit the shelves. Of note, while girls will certainly enjoy the books below, they will be particularly appealing to boys. Believe it or not, this boy detective made his debut in 1972! Along with his trusty dog Sludge, Nate the Great solves more than twenty mysteries in this wonderful series. The narration is in first person, allowing readers to enjoy Nate the Great’s cool, Sam Spade-like detachment. The deadly serious tone of the writing contrasts brilliantly with the fun illustrations and decidedly undignified situations in which Nate finds himself, making the books laugh-out-loud funny. Children will enjoy attempting to solve the surprisingly tricky mysteries alongside this great sleuth. This easy-to-read series, which debuted in 1982, is the brainchild of the incomparable James Marshall, who gave us the Miss Nelson and George and Martha series, among others. The books chronicle the exploits of Fox, a somewhat devious youngster who loves nothing more than skateboarding with “the gang.” Alas, Fox’s plans are often thwarted by the demands of school and helping out around the house. Fox often attempts to skirt obligations like minding his younger sister Louise or shopping for items on his mother’s endless grocery list, but things usually don’t turn out quite the way he plans. Kids will love reading about his hilarious antics, and the tongue-in-cheek illustrations add to the humor. We agree that you can’t judge books by their covers, but with titles like Knights of the Kitchen Table, Your Mother was a Neanderthal, and Viking It and Liking It, kids will be hooked before even opening these enjoyable chapter books. 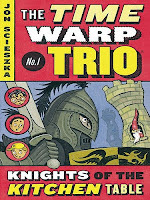 Scieszka’s series, complete with funny illustrations, tells about the adventures of Joe and his friends Sam and Fred. Joe’s magician uncle sends him a mysterious book for his birthday that allows the three to travel through time. They visit places/eras like Medieval England, Renaissance Italy, the Stone Age, and Ancient Egypt, and even flash forward in time to the year 2095 for madcap escapades that always nearly end in disaster and always definitely end in laughter. The first book in this series was published in 1991, but all of the titles remain timelessly enjoyable. 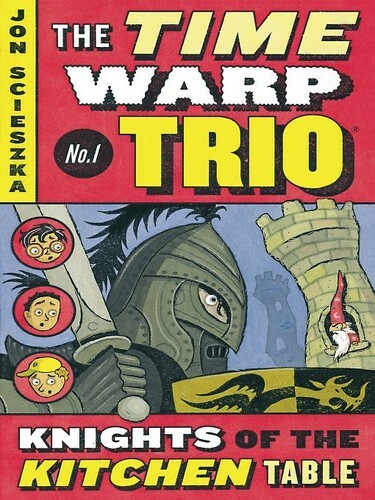 While your kids may not have a magician for an uncle, they can have just as much fun as the Time Warp Trio by traveling back in time with these series! *Interesting Fact: Marshall’s full name was James Edward Marshall. He wrote the Fox books as Edward Marshall but illustrated them under his more well-known name, James Marshall.